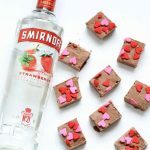 Easy, 3-ingredient drunk Peeps boozy fudge is a grown-up Easter dessert filled with vodka. I’m glad you asked. Boozy fudge is the best thing I’ve ever created ever. Three ingredients, minutes to make, delicious, and strong. This is a no-bake dessert, so the booze does not cook out. Hence, this fudge is NOT for children, and I trust you to label the stuff to be clear about that. 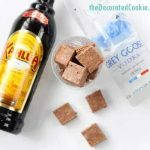 All you need to do to make boozy fudge is mix together powdered sugar, booze and melted chocolate. That’s it. You can use just about any liquor. I’ve made vodka, gin, whiskey, rum, tequila, Bailey’s and more. 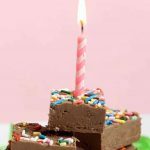 Boozy fudge is versatile. If vodka isn’t your drink of choice, substitute in other liquor. (Gin is a personal favorite.) You can also use any kind of chocolate, milk, semi-sweet, dark OR white. 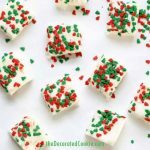 Find all my boozy fudge recipes HERE. On to the Peeps. These silly Peeps had a little too much and they are pretty drunk. I know some look dead, but drawing a “drunk” face on Peeps isn’t my finest-tuned skill. This boozy fudge should make for a very happy Easter. Line a 9 x 13 inch baking pan with parchment paper. Crease the edges so the sides are also lined and you can later use the parchment paper to lift the fudge out of the pan. If necessary, snip the corners of the paper with scissors. Place the chocolate chips in a microwave-safe bowl. Microwave for 90 seconds at 70 percent power. Stir and continue to melt at 30 second, then 15 second, intervals just until melted, stirring well each time. While the chocolate is melting, place the confectioner’s sugar in a large bowl. Whisk the vodka into the sugar. The mixture will look like icing. When the chocolate is melted, quickly pour the chocolate into the sugar and vodka mixture and stir very well. Scrape the chocolate, vodka and sugar mixture into the prepared baking pan. Spread evenly. Work quickly, as white chocolate sets quickly when mixed with liquid. 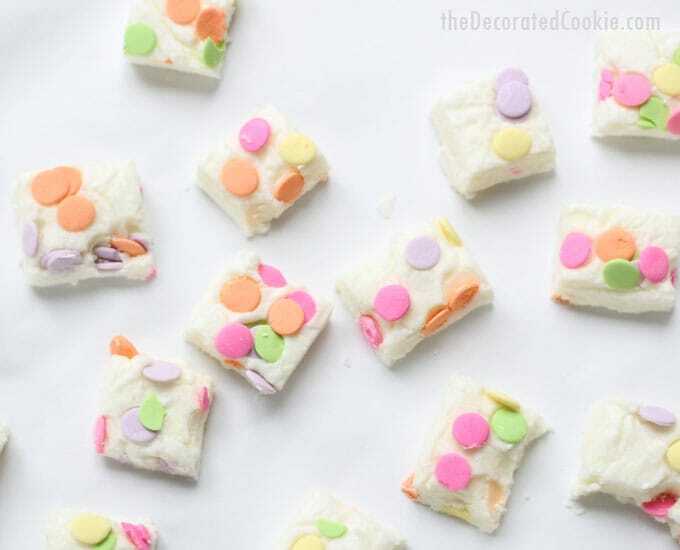 If desired, sprinkle sprinkles on top and gently press into the fudge. Let the fudge set in the refrigerator. Cut into squares. If fudge is soft, leave it in the refrigerator overnight. If desired, draw “drunk” faces on the Peeps and arrange on the fudge. 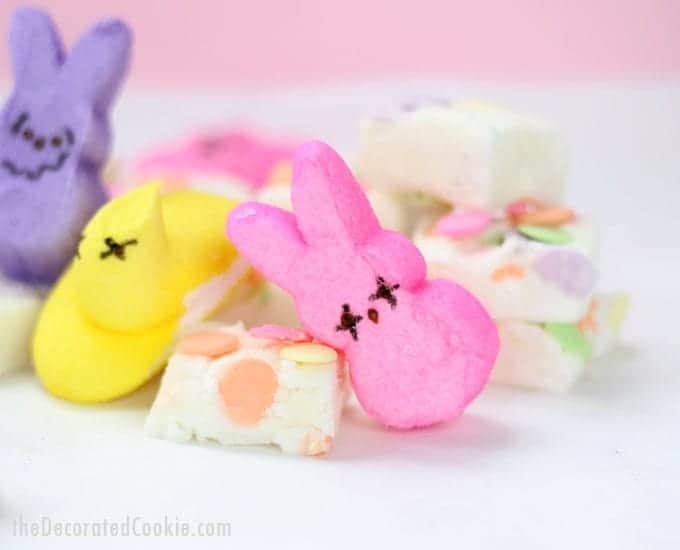 Use toothpicks to prop Peeps on individual pieces of fudge. Let the fudge set at room temperature just until firm or in the refrigerator. Cut into squares. 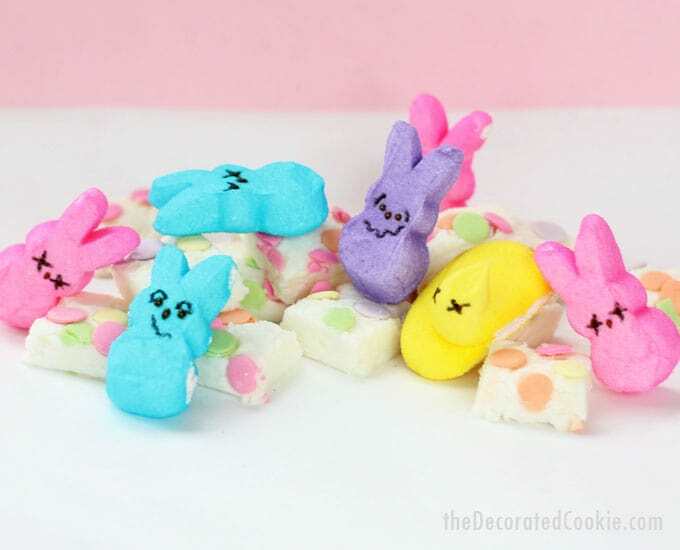 If desired, draw "drunk" faces on the Peeps and arrange on the fudge. Use toothpicks to prop Peeps on individual pieces of fudge.